Since 2004 Raja Ampat and the surrounding areas of the wider Birds Head Seascape (BHS) have been the focus of comprehensive, long-term conservation initiatives. The area’s priority in the world of marine conservation is justified, considering that the Birds Head is home to more marine species than any other area its size on the planet. For example, more than 70% of the world’s hard corals are represented, as are more than 1700 species of fish. Regional dive operators agree that their guests see more fish surrounding healthier reefs than they did a decade ago. Several factors can be credited with the success of marine conservation in Raja Ampat and the greater Birds Head Seascape. 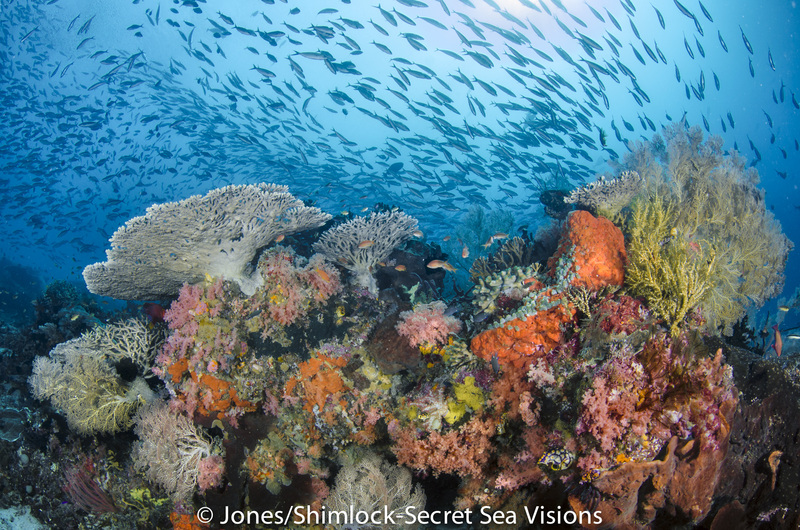 Perhaps most importantly, the conservation process has focused on establishing a network of Marine Protected Areas (MPAs), which now total about 25% of Indonesia’s protected areas. Subsequently the process provided effective management and enforcement of the MPAs. One important difference between the BHS and other MPA networks is that in the BHS, local community leaders have been hired as MPA managers and patrol team members, which generally ensures they are passionate about protecting their own reefs. In the rest of Indonesia, managers and rangers are normally chosen from top national universities, which means they have a good education, but usually do not have a kindred stake in the areas they have been hired to manage. The BHS conservation initiative has also forged strong partnerships with the provincial and regency governments, the State University of Papua, local and international NGOs and marine tourism operators including resorts, liveaboards and local homestays. Divers who visit the BHS contribute to marine conservation by observing proper conduct rules; paying entry fees, which go into a state-managed fund for BHS villages; and contributing to and participating in NGO-managed conservation efforts. By investing in building the management and enforcement capacity of local community leaders and devising strong partnerships, the Bird’s Head initiative has succeeded in largely eliminating blast and cyanide fishing in its MPAs and now oversees recovering reefs and their fish stocks, much to the benefit of diving tourists. A parallel focus on marine conservation education of coastal schoolchildren (using floating environmental education centers like the Kalabia in Raja Ampat) has also been successful in developing a sense of ownership and pride in the seascape’s spectacular marine resources. Protecting turtle nesting beaches has been a key initiative of groups like the Papua Sea Turtle Foundation and the Bird’s Head Leatherback program. Now green and leatherback rookeries across the seascape are almost completely protected from poaching. By no means should the BHS be considered a perfect model for marine conservation; there is a lot of work left to do. But Indonesia’s national government has noted the BHS’s accomplishments. 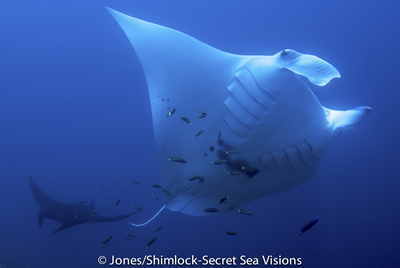 Recently, the partnership that worked with the Raja Ampat government to declare and legally protect Indonesia’s first shark and ray sanctuary, (the first such sanctuary in the entire Coral Triangle) is now leveraging the national government to follow suit with country-wide protections for mantas and some shark species. Last May, Indonesia’s Minister of Marine Affairs and Fisheries followed with a law protecting whale sharks, and promised more legislation would follow. Across the seascape, authorities are beginning to develop new rules to better manage tourist interactions with mantas and whale sharks. Overall, the future looks good for both the marine life of the Bird’s Head and the divers who travel here. Perhaps the most critical strategy of the Bird’s Head Seascape initiative is to prove to the governments and people of West Papua that marine tourism has tremendous potential for sustainable economic development and can provide jobs, taxes and multiple indirect benefits to the region. By visiting the Bird’s Head, you help convince its government and residents of the value of protecting their rich natural resources instead of exploiting them for quick profit from mining, forestry and industrial fisheries. Dr. Mark Erdmann is senior advisor for Conservation International-Indonesia’s marine program, with a primary focus on managing CI’s marine conservation initiatives in the Bird’s Head Seascape in West Papua. Mark is a coral reef ecologist (Ph.D. University of California, Berkeley) who has lived and worked for the past 20 years in Indonesia. During this time he has logged nearly 10,000 scuba dives while surveying marine biodiversity throughout the region. He has published 107 scientific articles and 4 books, including most recently the 3-volume set “Reef Fishes of the East Indies” with colleague Dr. Gerald Allen. Erdmann was awarded a Pew Fellowship in Marine Conservation in 2004 for his work in marine conservation education and training for Indonesian schoolchildren, members of the press, and the law enforcement community. Though his work is now largely focused on the management of marine protected areas, his continuing research interests include reef fish and mantis shrimp biodiversity, genetic connectivity in MPA networks, and coral reef restoration techniques, and he maintains a research associate position with the California Academy of Sciences. He is also active on the boards of a number of local NGOs within the Coral Triangle, including Yayasan Kalabia, Reef Check Indonesia, El Nido Foundation, and the Asian Conservation Foundation. Mark now lives with his wife Arnaz and three children (Mica, Brahm and Cruz) in Bali, and maintains a deep personal commitment to do whatever is necessary to ensure his children will be able to enjoy the same high-quality underwater experiences that continue to provide the inspiration for his dedication to the marine environment. Burt Jones and Maurine Shimlock are award-winning photojournalists who specialize in documenting tropical marine life and pioneering remote dive destinations. 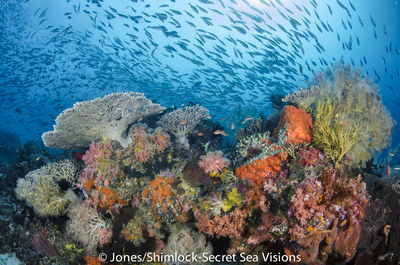 Since 1992 they have explored the Indonesian archipelago and recorded images of its spectacular reefs. In 2002 they began working with the Indonesian branches of several NGOs, including Conservation International, to educate the world about Indonesia’s reefs and the urgent need to conserve them. They have published two popular guidebooks to the world’s richest reefs, Diving Indonesia’s Raja Ampat and Diving Indonesia’s Bird’s Head Seascape, which have promoted sustainable marine tourism as a way of preserving these regions’ unsurpassed marine life. Their photography has been featured on the covers of more than a dozen of the world’s most prestigious publications, including GEO, BBC Wildlife, Smithsonian, and Natural History. Secret Sea, the first large format collection of their photography, has won several publishing awards including the Benny Award for best photography book. In 2012 Maurine was inducted into the Women’s Diving Hall of Fame and honored for her photojournalism and conservation work. Committed to marine conservation, Burt and Maurine use the art of photography to help preserve life in the sea.